What is disability and who does it affect? Disability is defined differently in different countries, and in some countries it is not recognised at all. In the UK, a disabled person is someone who has a physical or mental impairment that has a substantial and long-term adverse effect on his or her ability to carry out normal day-to-day activities. An estimated 1 billion people, or 15 percent of the world’s population, live with disabilities and it is predicted that this figure will rise in the future as a result of people living longer. In the UK, over 11 million people or around 17 percentage of the population are disabled. According to the first World Report on Disability, people with disabilities have generally poorer health, lower education achievements, fewer economic opportunities and higher rates of poverty than people without disabilities. This is largely due to the lack of services available to them and the many obstacles they face in their everyday lives. Over a third of children missing out on getting an education – nearly 20 million – have a disability, even though the inclusion of children with disabilities in mainstream education has been shown to be successful. In the UK, disabled people are three times as likely not to hold any qualifications compared to non-disabled people. Unemployment amongst disabled persons is as high as 80 per cent in some countries. Global literacy rate for disabled women may be as low as one per cent. Nine out of ten children with disabilities in developing countries do not attend school. The obstacles faced by persons with disabilities are most acutely felt by the most vulnerable groups in society, such as older persons or the poor. Those living in poverty are also more likely to develop disabilities due to a lack of access to medical treatment. On a global level four out of five persons with disabilities live in poor countries. In the UK, the poverty rate among disabled adults (30 percent) is twice as high as for non-disabled adults. According to the UN Children’s Fund (UNICEF) children who are poor have a greater chance of becoming disabled through poor healthcare, malnutrition, lack of access to clean water and basic sanitation, dangerous living and working conditions. Once disabled, they are more likely to be denied basic resources that could help alleviate or prevent deepening poverty. Many persons with disabilities face barriers to participation in their communities and are often forced to live on the margins of society. The degree to which this is the case depends on the country in which they live and their particular circumstances. For example, in many countries, women and girls can face multiple disadvantages, experiencing discrimination and exclusion on account of their gender, disability and poverty. Women and girls with disabilities are particularly vulnerable to abuse. A small 2004 survey in Orissa, India, found that virtually all of the women and girls with disabilities were beaten at home and ignorance and fear of disability has led to six percent of the women surveyed being forcibly sterilised to avoid them having children. Whether male, female, an adult or a child, disabled people face stigma and discrimination and are routinely denied basic rights such as: food, education, employment, access to health and reproductive health services. There is a strong link between disability and poverty, as both are cause and consequence of the other and contribute to increased vulnerability and exclusion. People with disabilities, despite the barriers contribute to society on a daily basis and in many cases take down barriers as they further everyone’s knowledge and understanding of the world. Tanni Grey-Thompson who was born with spina bifida, a birth defect in which the spinal cord isn't completely developed which left her a wheel chair use, went on to become one of Britain’s most successful disabled athletes. During her sporting career she won 11 gold medals over five Paralympic Games and is now a member of the House of Lords. In 1997 David Blunkett, a Labour MP, became the first blind British cabinet minister when he was appointed Secretary of State for Education and Employment. He later went on to become Home Secretary and Secretary of State for Work and Pensions. During his career in Parliament he has been accompanied by a number of successive guide dogs who are often found sleeping at his feet during debates in the House of Commons. The cornerstone of the UN’s work on disability is the Convention on the Rights of Persons with Disabilities (CRPD). The Convention is the culmination of decades of hard work by the UN, disability rights groups and individuals around the world. The UN Convention enables disabled people to hold the government to account full and equal enjoyment of all human rights and fundamental freedoms by all persons with disabilities, and to promote respect for their inherent dignity. All countries who choose to sign up to it, agree to make its rights a reality for people within their territories. Adopted on 13 December 2006, it formally opened for signature on 30 March 2007 and broke records by becoming the treaty with the most signatories on its opening day, and the fastest enter into force – the process by which a treaty’s provisions become law. As of January 2014, 141 countries had adopted the treaty. 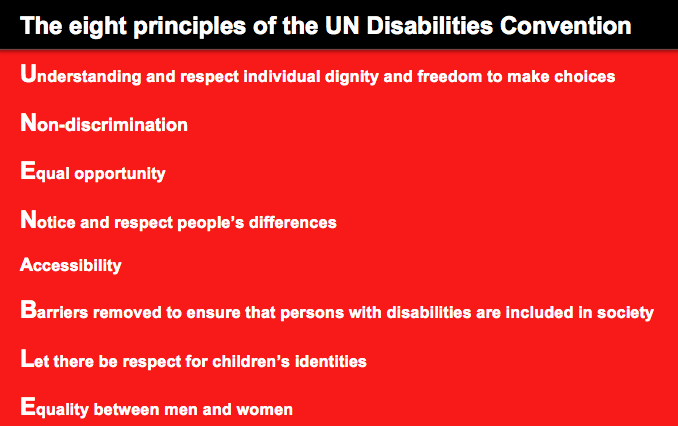 UN Enable is the official websites for the Convention.